Michele Tantussi/Getty ImagesDara Khosrowshahi, CEO of Uber, speaks at the 2018 NOAH conference in Berlin. Uber raised $US2 billion in bonds this week, the company confirmed to Business Insider on Thursday. It’s the ride-hailing company’s first ever bond offering, and was able to maintain its secrecy through the private placement. Uber has quietly sold $US2 billion worth of bonds to a small but eager group of investors this week in a so-called private placement that allowed the ride-hailing giant to maintain its notorious veil of secrecy as it races towards an IPO next year. The offering was made up of two coupons: $US1.5 billion worth of eight-year notes with a yield of 8% and $US500 million of five-year notes at 7.5%, according to the Financial Times. The company received $US3 billion worth of orders, a source with knowledge of the offering, told the paper. 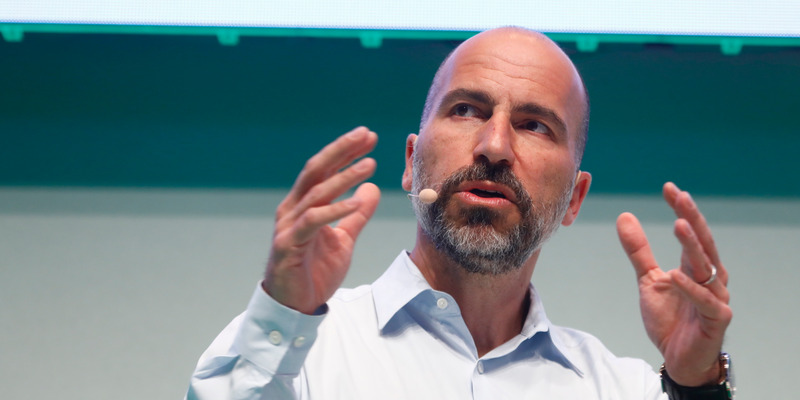 An Uber spokesperson confirmed the $US2 billion sale to Business Insider. As Uber gears up for an IPO as soon as next year, one that could leave it with a valuation topping that of the biggest three automakers combined, it’s been successful in keeping its financials under wraps. Those institutional investors lucky enough to snap up the paper were asked to sign confidentiality agreements, Bloomberg News reported. Typically, raising money through debt offerings requires at least some disclosure of financial information in order for potential investors to make an informed decision. Luckily for Uber, the demand was high enough that the revelations were limited in scope, according to Bloomberg. What’s more, a Morgan Stanley banker who moonlights as an Uber driver could be the company’s secret weapon in buddy-ing up to banks – and keeping its dealings private, the Wall Street Journal reported. Michael Grimes, the firm’s head of technology investment banking, has a knack for researching potential clients through gigs like driving on the Uber platform or incessantly studying his daughter’s Pandora usage, according to the paper, adding that Morgan Stanley and Goldman Sachs have both given presentations for Uber’s eventual IPO. It’s not the company’s first foray into debt offerings. Uber has raised tens of billions through equity sales and loans before, but this is the first time its offered bonds with yields this high. Still unprofitable, Uber is reportedly seeking investors to take minority stakes in its self-driving car unit, as it seeks to slow its cash burn. As Uber raises cash, its closest US competitor Lyft is also racing towards an IPO in early 2019, possibly earlier than Uber. The firm has tapped Credit Suisse to assist with book running for that offering, expected to be above its $US15 billion private valuation, with JPMorgan reportedly leading the banking effort. High-yield bonds like Uber’s have been popular this year, especially for tech companies which can burn through loads of cash. WeWork, the co-working space landlord, raised $US500 million in high-yield coupons earlier this year. Netflix, notorious for its cash burn as it invests in streamable content, in April said it would offer $US1.5 billion in junk bonds.